See the factors that could produce a record operating year for the consumer goods titan. 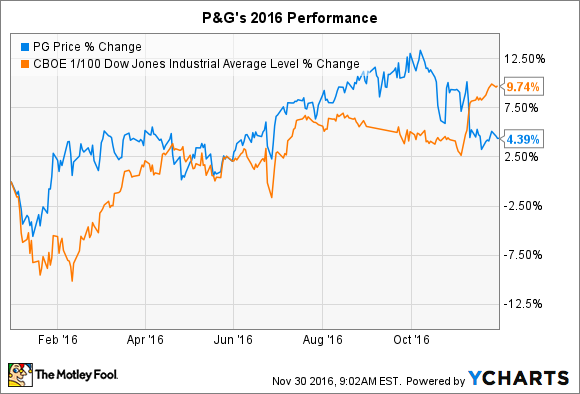 Procter & Gamble's (NYSE:PG) stock is ending 2016 just slightly ahead of where it started the year. Shares are up 4%, trailing the Dow's 10% gain. I recently highlighted a few reasons why the consumer goods giant might underperform again in 2017. Today I'm looking at the bullish case -- the key factors that could drive market-beating gains for shareholders in the coming year. It has been more than two years since P&G could claim significant market share gains in its core consumer goods categories. Organic sales growth last year ticked down to 1% from an already weak 2% the year before. Rivals have fared much better. Kimberly-Clark (NYSE:KMB), which competes with P&G in the diaper category, posted 5% organic growth last year and 4% the year before. Unilever's (NYSE:UL) comparable numbers were 4% and 3%, respectively. P&G is making progress at turning things around, though. Last quarter, organic sales improved to a 3% pace. Each of its largest product categories, and both of its biggest geographic markets, saw better results. The company left its full-year sales growth forecast in place, which predicts 2% comps. Over the longer term, sales gains should accelerate now that the company has shed its worst-performing brands. In fact, management believes the new, slimmer portfolio will grow at a full percentage-point-faster rate than the old one. Shareholders haven't seen firm evidence of that happening yet, but that might come in the form of organic growth in the 3% to 5% range for the second half of fiscal 2017. 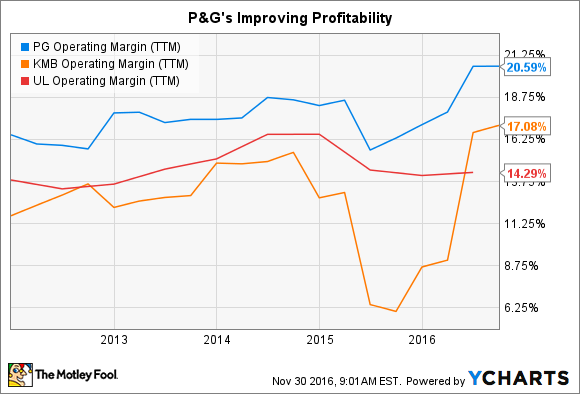 Whether sales growth recovers quickly or not, P&G is becoming a more profitable company. Gross and operating margins both improved by over a percentage point last quarter as executives squeezed costs out of every area of its business. PG Operating Margin (TTM) data by YCharts. While it has already removed well over $1 billion from its annual cost burden, the management team sees that success as just the beginning. Through initiatives like revamping its distribution network, digitizing and automating production lines, and simplifying manufacturing platforms, P&G plans to deliver an additional $10 billion of savings through fiscal 2021. The cuts appear set to put the company right back on its profit growth target. Core earnings are expected to rise by the mid-single digits over the next year, reversing the 2% decline that it booked in each of the last two years. Savings of that magnitude should also produce excess cash that the company can use to goose shareholders' total returns through dividends and stock repurchases. Another benefit of having more cash laying around is that the company can boost investments in the critical category of innovation. Research and development spending has held steady at $2 billion per year over the last few years, and so P&G could benefit from a stepped-up focus there. After all, it hasn't succeeded in launching a new $1 billion brand in over a decade. While the company made helpful tweaks to hit franchises such as Gillette, Tide, and Pampers, none of these have had the game-changing impact investors saw with Febreze and Swiffer in the late '90s. The company's outlook could turn sharply higher, though, if it ends that drought by releasing a few category-creating brands over the coming years. Ultimately, its impossible to predict how the market might respond to P&G's successes in these areas. However, over the long term, innovation-powered market share growth would likely produce significant gains for investors.